Once again Lady Luck had looked down and smiled upon me! This folks is the fantastic work of Fly Design at RedBubble. 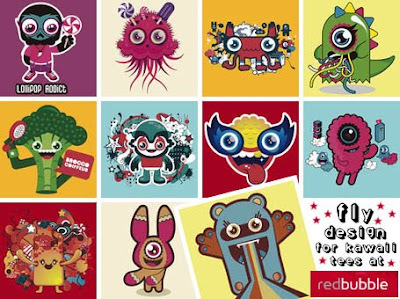 A vibrant and stunning collection of t-shirts from the Argentinean design studio. Realising that not everyone shares my talismanic talent I though I’d better share my good fortune with you. After all, what’s the point in being lucky if you’ve got no one to share it with? Enjoy! Itasho Erasers! Making Mistakes Fun! Guy Behind KawaiiPunk Revealed! Again! Perfect Partners Puzzle! Sneaky Mascot! Pirates and Petticoats! Weirdly Wonderful!